A few weeks ago, I mentioned Gabe and I were going to participate in Run For Your Lives 5K, a first-of-its-kind obstacle course adventure run series where runners are chased by zombies! 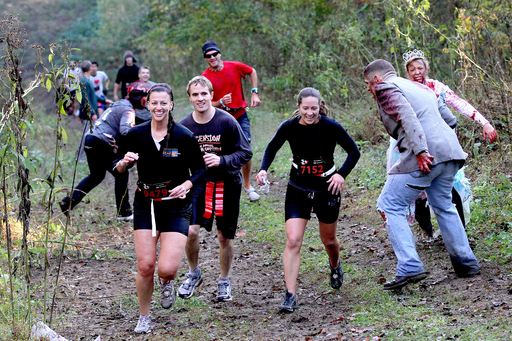 The zombies will try to end your life by grabbing flags from the runners’ flag belts. Similar to flag football, runners must reach the finish line with at least one flag to claim survival. At the end of the race, runners and spectators (who get in for free) celebrate survival or their zombie infection at the Apocalypse Party with music spun by the RFYL traveling DJ, entertainment, dance-offs, beer, food, and festivities! I have two free runner tickets to giveaway to any of the Run For Your Lives races throughout the US in 2013. 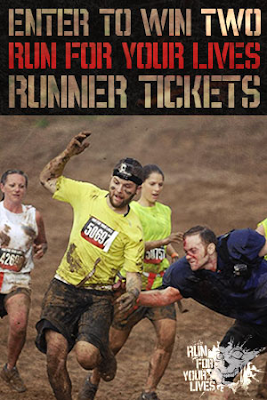 To enter, tell me why you want two free tickets to Run For Your Lives 5K in a comment below This part is mandatory and you can verify through the rafflecopter widget at the bottom of this post. I have two Run For Your Lives shirts to giveaway! This run also works with charitable partner KennedyKrieger. A portion of ticket sales goes to raising awareness and funds supporting research and care for kids battling brain injuries, so if you don’t want to run for your life, you can Run For THEIR Lives. Check out their upcoming race locations, and if you want to register, you can use my special discount code ZPTD2 for 15% off any of the RFYL in the US. For the second place winner, I will provide two Run For Your Lives 5K shirts to the winner. 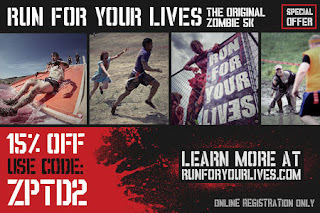 Run For Your Lives is providing two free runner registration tickets to one of their 2013 remaining races. Run For Your Lives and I Run For Wine are not responsible for winner’s transportation, lodging and travel. The giveaway will run from August 27th, 2013 through September 3rd, 2013 and is open to all U.S. residents 18 years and older. The winner will be selected through Rafflecopter and will be notified by email. The winner must respond within 72 hours after being notified. The winner will be put in contact with Run For Your Lives to obtain their two free runner tickets. I also have a FRS Healthy Energy giveaway going on right now. Click here to enter that one! I'm kinda scared of Zombies..,..I think I I would run faster for sure!!! I'd love the chance for a PR from being scared!!! Ha! I want two free tickets because I'm a new runner (first 5k this year) and while I normally use beer or food as motivation, zombies will probably make me run faster!! My son is 'dying' to run this race. I'd love to run it with him! It sounds like an overall fun run I have been looking at it for while but wasn't sure I would have the funds to participate! I've lost 40 lbs since switching to an overall healthier lifestyle last summer, and I'd love to be able to complete an obstacle 5k. I think Run for Your Lives would be an awesome motivation! This is a really fun race! I did it in So Cal last October and made it through as a survivor. I would love tickets to this year's because they changed the medals and made 2 different ones. One for survived and one for infected. We all got the same last year. I am loving the way the infected medal looks and might just let those zombies have a little bite! This race is the reason I decided to start running. I had hoped to do to do the one earlier this year outside of Indy but had a family engagement. I had intended on running the Illinois race in September but after my wife and I found out we are expecting our first, we started budgeting funds to prepare for our baby and started making sacrifices which included my race budget. I had to chose between RFYL and my first half. I would love to not have to wait for next years RFYL schedule. My husband and I were survivors in the 2011 and 2012 Run For Your Lives Maryland events but just haven't had the extra funds to register for 2013. We were really looking forwad to it because it's at a new location this year. We LOVE this race and the obstacles are insane! The zombies are the BEST PART!!! I want to participate because I set a goal this year to do 12 - 5k's and this would help me actually get past this goal. I'm on about 19 now, plus the Illinois race is really close to my house.